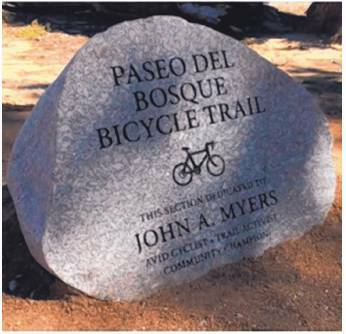 ALBUQUERQUE PARKS AND RECREATION DEPARTMENT The Paseo del Bosque bike path from Central to Alameda is now named in honor of real estate lawyer and avid cyclist John Myers. No John Myers has not passed away. The stones bearing his name along the Paseo del Bosque bicycle trail from Central to Alameda are not memorials or tombstones. But a few people worried they were, after they were installed last week in honor of Myers - who was present at the dedication ceremony - as a celebration of the " community champion and avid cyclist. " " I got a few emails, " he said this week, laughing. He said the three plaques placed along the bike path he loves so much are " incredible. " " I don't know that I deserve this, but it was certainly flattering and if there is anything I'd like to have my name associated with, it's certainly that bike trail, " Myers said from his law office in Albuquerque. Myers, described on the plaques and an " avid cyclist, trail advocate and community champion " has worked in real estate law for 40 years. The plaque dedication was led by the Urban Land Institute New Mexico, a group that " provides leadership in the responsible use of land and in creating and sustaining thriving communities worldwide, " in partnership with the City of Albuquerque's Parks and Recreation Department. The Institute has also created a John A. Myers Award for Leadership in Urban Excellence.
" John has had his hand in most substantial real estate projects in the Albuquerque metropolitan area, " the institute said in a news release about the dedication, which was held Oct. 7 and attended by Mayor Richard Berry. " Mr. Myers, whose knowledge, wisdom and genuine concern for fair and equitable outcomes, have made some of the city's most significant development projects possible. " " John Myers is upstanding attorney, but more importantly, an upstanding, compassionate citizen of Albuquerque. I've been fortunate to not only work with him, but to also call him a personal friend. He has been a constant presence on our trails and I can think of no better way to honor him than by dedicating the Paseo del Bosque Trail to him, " Berry said in a written statement. Myers lives his wife, Alice, of 41 years and shares time with his children, Matt, Lucas and Katie, and his grandchildren, " the twins" Zoe and Julian and Haeleigh and Mela, according to ULI.
" I rode that trail every day for 20 years, to work, to softball games, to tennis games. I'd ride it anywhere, " Myers said. A recent health challenge has limited his bike riding, but he said the trail is still " a gem. " " I'm extremely appreciative of what was done, and I thank all the people who were involved and were willing to give me that nice honor, " he said.